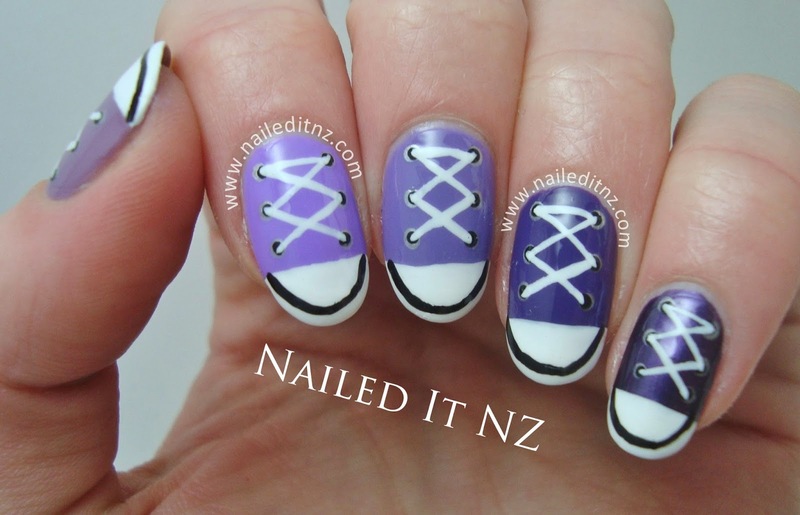 One of my most popular picture tutorials of all time is this converse one. I swear it must have gotten me at least 10,000 of the 30,000 likes I have on Facebook - it keeps going viral, and thanks to my obsession with watermarking it directs people right back to me! I decided to finally make a video tutorial for it, as there are some tips you just can't squeeze into one picture. So here it is! Please subscribe to my channel! I have a confession to make, though... I currently don't own any pairs of Chucks. I used to have quite a collection during high school, but over the years I barely wore them and sold the last two in 2013. I'd love some Hunger Games or Doctor Who themed ones though - bucket list material! Warning: you'll be making your fingers 'walk' everywhere if you paint these on your nails! While I liked the purple ombre effect I've got going on in this version of these converse nails, I will always prefer bright colours. These nails will be in the newspaper, too! It comes out on Wednesday, I'll probably make a little blog post about it - if I like the article, eek! Hope you liked this tutorial and blog post! Do you own any pairs of these shoes? If so, what do they look like? I love the variety of colours and designs they come in! These are cute and looks so realistic too.